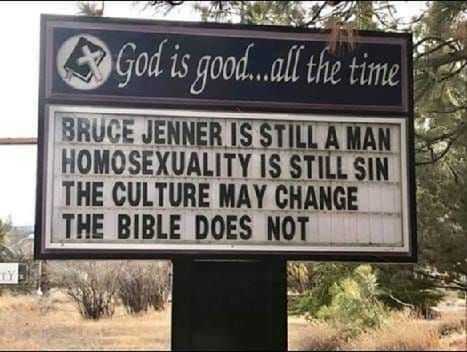 WEED, Calif. — The pastor in California who faced community protests after posting a sign that reads “Bruce Jenner is still a man. Homosexuality is still sin. The culture may change, the Bible does not” is now out of a job after also being told by his co-elder that he can no longer follow his leadership and that all but one couple would leave the church if he continues as pastor. Justin Hoke, the pastor of Trinity Bible Presbyterian Church in Weed, which is a part of the Bible Presbyterian Church denomination, posted an update to social media on Saturday evening outlining that he had essentially been forced out of the position. Hoke explained that it was “determined that it would be in the best interest of the local body for us (TBPC and the Hoke family) to part ways.” He added a note of clarification on Monday morning that his departure was not of his doing. “I did not want to leave, I did not quit, and I was willing to stay,” Hoke emphasized. As previously reported, Hoke’s sign resulted in two community protests, led by three women unaffiliated with the church who saw a photograph of the churchyard message on Facebook. Hoke told reporters that his message was one of love, not hate, as love warns others of danger instead of simply letting them suffer the consequences. It would be unloving to stay silent, he outlined. “[T]he command for all Christians is to preach to them the gospel faithfully, calling them to repentance and faith, that they might be changed by the Holy Spirit and brought into the family of God,” he also told The Daily Wire. A yet-unknown vandal damaged the church sign last week—breaking the plexiglass, scrambling and stealing some of the letters, and damaging the power supply that lights up the sign—but Hoke was able to restore the message. While the pastor faced objection from those in the community, he soon also found himself lacking backing from his church. It is not clear exactly what the concerns were—whether the church was unhappy due to the protests and media attention, or if some disagreed with Hoke’s methodology, or both. Hoke confirmed to Christian News Network that his congregation agrees that homosexuality is sin, but advised that he could not provide further detail about the situation at this time. Hoke stated on Monday via social media that a number of online supporters have asked how they can help him in a “physical or monetary way” now that he has lost his job as pastor, but he declined any such assistance, advising that all he desires is to share the gospel. “Please pray that God would open more doors for me to preach the gospel; that is all I want or need,” Hoke wrote.